A guide to selecting the right telescope for you or your child. Avoid “Department Store Telescopes” like this. They gleam seductively and tout high power! They are long and skinny, stand on wobbly mounts and cost $50 to $150. They are junk! What you’ll see through them is fuzzy and blurred. These telescopes have turned millions of bright children off to science. 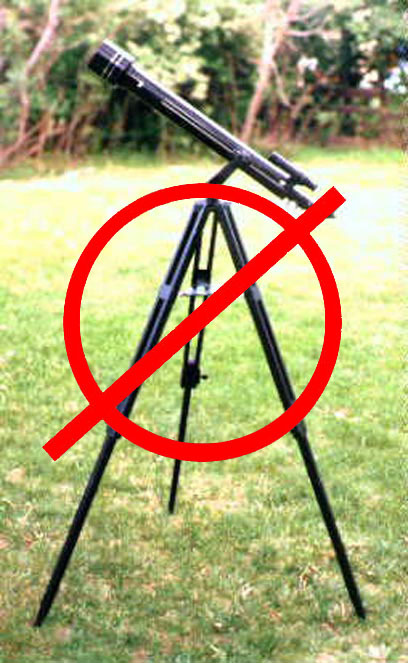 Avoid these telescopes! If you have purchased one of these and cannot get your money back please see my page Fixing a Cheap Telescope. Start with a simple pair of binoculars and a star chart. There is much to see with ordinary binoculars if you know where to look. Something with large aperture is best. For example: 10×50 is better than 10×35 and 7×35 is better than 8×20. The second number is bigger in the best binoculars for astronomy. But that factor is not very important. Use whatever you have. All proficient amateur astronomers carry binoculars no matter what kind of telescope they have because you can see a lot with binoculars if you know where to look. Binoculars are easy to use, inexpensive and help you find your way in the sky. Visit your local astronomical society or club. They probably have frequent “Star Parties” where you can learn about telescopes and the night sky. They will let you look through a variety of telescopes and show you what to look for in a quality instrument. If you are handy, you can build your own telescope relatively easily and inexpensively. You don’t have to make your own mirror. A hardware store has most of the necessary materials. You’ll need Richard Berry’s book Build Your Own Telescope or Making & Enjoying Telescopes by Miller and Wilson. Check out my page The Perfect Telescope to see many ordinary people who have built a good telescope. Buy from somebody who actually uses telescopes for Astronomy. They will know what to look for in a quality instrument. Many stores sell telescopes but have no idea how to use them! Would you buy a computer at Burger King? Even seemingly “education oriented ” retailers sell junk telescopes! There are some stores in big cities that specialize in telescopes and are staffed by experts. Check with your local astronomy club to find a good store in your area. Computerized telescopes may be very attractive but they sometimes have problems, as with all computers. More importantly, they may reduce your enjoyment of astronomy. Learn your way around the sky. It will save you the extra expense of the computerized telescope and is more fun in the long run. Buy Nightwatch by Terence Dickinson. Also be sure to visit your local planetarium to learn about constellations, planets, etc. Don’t buy a telescope at a discount store or regular retailer. Even Camera Stores, Sporting Goods Dealers and Toy Stores often sell inferior telescopes. Don’t buy one online or from a TV shopping channel. Carefully read The Backyard Astronomer’s Guide by Dickenson and Dyer and Starware by Phil Harrington, before you spend any money. Both Astronomy and Sky and Telescope magazine also review telescopes frequently.